Brown rice is high in nutrients such as manganese, thiamine, niacin, phosphorus and magnesium, and white rice is often enriched, so it is a good source of folate, niacin, thiamine, iron, selenium and manganese. But when it comes to weight loss, brown rice is the better choice, because it is lower in calories and higher in fiber than white rice. The only way to lose weight is to eat fewer calories than you burn each day to create a calorie deficit. A 1-cup serving of white rice has 242 calories. 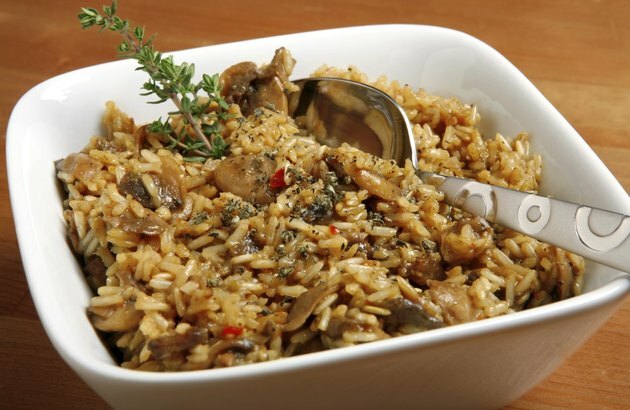 Choose brown rice instead and you can eat the same amount of rice for 218 calories, saving 24 calories. Although this is a fairly small amount, if you eat a cup of brown rice per day, you'll save 720 calories in a month, which is a more substantial amount. Not only is brown rice lower in calories, but it's also higher in fiber than white rice. Each 1-cup serving has 3.5 grams of fiber, or 14 percent of the daily value, compared to just 0.6 gram of fiber in the same amount of white rice. Fiber helps you lose weight by slowing the emptying of the stomach so you feel full longer, which helps you eat less. It may also reduce the amount of calories you absorb from macronutrients, such as fat and carbohydrates. How Much Brown Rice Should I Eat?